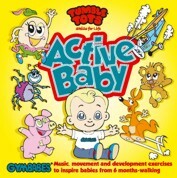 Designed for children from 6 months to walking, Active Baby is full of simple rhymes, songs and developmental exercises that all children will love to join in with alongside mum and dad. As usual we have included all the words and actions in the booklet for maximum involvement. 4. Can You Play At Peekaboo?